Yesterday I returned my review pages of Tiny Boxes to my publisher with my findings marked in red pen. Others at Taunton Press are also going over the text, looking for errors that need to be fixed and made right. Today I plan to begin writing text for my box guitar book, as I hope to have the first chapters off to the publisher during July and August. Boys may love the work of the manual-training school and dislike history, grammar, and mathematics, and all book-learning, in fact; but to be excellent in manual training would not prevent him from being illiterate and a bad neighbor and a bad citizen — even a dynamiter. His absurd assumption as secretary of Education was that the use of tools was mindless and that the use of tools stifled the imagination and left the bodies of the young deformed. No doubt, he thought he was doing good things, just as the proponents of No-Child Left Behind, the common core, and the "school choice" movement think they are doing very good things. Harris' report is preserved at the conclusion of Calvin Woodward's rebuttal of it, The Educational Value of Manual Arts Training. The question must be asked, "why are educational policy makers so out of touch?" The answer is simple. As students progress through schooling into "purely intellectual" pursuits, and are no longer subject to the reality check provided by actual experience, they tend to go out on a limb. As those students progress further, and are given positions of authority, they become a danger to society. But craftsmanship, whether practiced in school or out involves the exercise of values. Manual arts taught in school are a way through which values of creativity and craftsmanship are passed between generations... as are music, the arts, laboratory science, theater and more. "Purely Intellectual" pursuits in school like those promoted by Harris and others of his committee are an exercise in stupidity. My conclusion is that knowledge, intelligence, skill, power and culture are always helpful in the acquisition of more knowledge, more intelligence, more skill, more power, and more culture. The more accomplished one is, the easier new things are to him, whether in the realm of pure intellect or in the field where mind and hand are cultivated together. Evidently Harris, having been raised in a purely intellectual fashion, saw nothing but drudgery and degradation in the craftsman's labor. His idea was that hand-work was an expression of mindlessness. Such stupidity ought to have no place in schooling, but readers should be aware that there are still such idiots in positions of power in American education. Today I am reading through the loop for my Tiny Boxes book, finding minor things that need to be fixed. Editing is not my strong point, but as it has been pointed out to me, there is no one better suited to seeing what needs to be fixed than the author, even if that ties me to the computer for a few days to come. I hope the book becomes a best seller. I am back in Arkansas and recovering from 9 days of intense woodworking at the Marc Adams School of woodworking. I had 17 students in each in three classes. One student, Mark, aged 82 made it through 9 days of class along with my trusted assistants. I may in the future, choose to go only for 7 days in a stretch as 9 seems to have left me (and others) worn out. Today I will be unpacking, putting tools in their proper places and will catch up on my review of "the loop" from my tiny boxes book. William Torrey Harris was a complex character in American education. On the one hand, he helped Susan Blow to form one of the first public school Kindergartens in the US, and on the other, he led the movement to take American Indian children away from their families to put them in boarding schools. He was quite literally an enemy of manual arts training and saw little value in it. 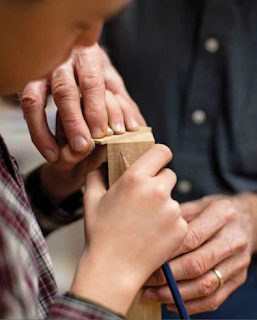 As head of the US department of Education, he submitted a report highly critical of manual arts training that elicited a response from Calvin Woodward that can be read entirely (both sides) here: The Educational value of Manual Arts Training. It's worth reading as it helps to illustrate the challenges that will be faced if we are able to proceed in an attempt to restore manual arts education in American Schools. There may still be those who are foolish enough to believe that the hands and brain are distinct organisms that should be taught in isolation from each other. Tools are the product of intellect, and the use of tools the means through which intelligence is created. Froebel understood that, but apparently, some others did not. Make, fix, create, and extend to others the means of learning likewise. This morning I am in a roadside hotel in Effingham, Illinois, relaxing just a bit on my way home to Arkansas. The last two days of my 9 days of classes were intense, as the small cabinet would have been best as a three day class. Given that the last two days were added at the culmination of a full week of intense classes, I felt I was not at my best and made some mistakes in set-ups that could have been avoided with a fresher mind. My students, also were feeling the strain. One of my students, Mark, had been with me for the full 9 days, as had been my assistant Jerry. I had kind of a fitful night of sleep, as my mind was reviewing and processing an intense week. I also had weird dreams about having a pet white rat that could talk to me and confide its concerns about society and humanity (and the lack of it) in these uncertain times. In any case, I am on my way home, and am looking forward to being in my own shop, where my set-ups affect only my own work and my own success. I applaud those whose courage led them to join me at Marc Adams School of Woodworking for any of my three classes, and thank them sincerely for their kindness. We concluded our 5 day class at MASW with a small exhibit of work a shown along with my students who made all these boxes with their own hands, new skills and design inclinations. Today I start a two day class in which students will make small wall hung cabinets. This will be my 5th day of box making class at MASW, and my seventh day of classes. I have been selling copies of my books, and talking some about eduction, how we learn, and why woodworking education should be part of every child's learning, regardless of age. Even adults need hands on learning and would choose it for themselves if given an opportunity. Marc Adams School of Woodworking is the perfect place for that. I was too busy during the day to take fresh photos but took a few this morning as I walked through the bench room. My students have each made a variety of interesting boxes. Today I will be teaching how to make wooden hinges and begin making inlay. We will also continue installing brass hinges in boxes. Jigs are set up for cutting finger joints and miters, and it has become difficult for me to interrupt students to offer demonstrations. It is wonderful to sit back every now and then to watch my students at work. Tonight I'll have a brief slide show and guests are welcome. This was my 4th day at Marc Adams School of Woodworking and my second day of my 5 day box making class. We began making finger jointed boxes using dedicated router tables we made in 2013 for an earlier class, and it was a bit surprising that with only minor adjustment, they provided perfectly cut joints.You can see the finger joint jigs being in use in the photos above and below. In the meantime, the "loop" that allows me to review my Tiny Boxes Book has been sent, and I'll have a chance to review it when I get home. 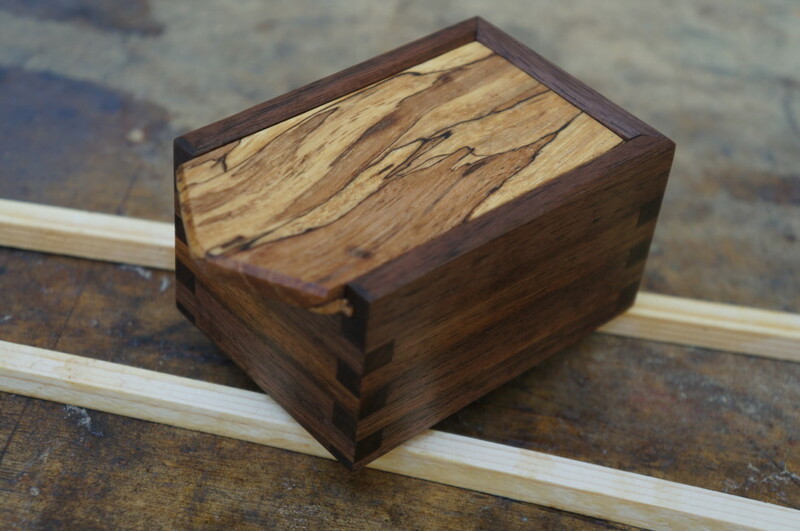 We finished our first day of the 5 day box making class and what you see here are photos. We had a design lesson, safety instruction, made a miter sled, and began box making. Today I start a five day box making class that is named after my second book, Simply Beautiful Boxes. We start with a discussion of design, will be making jigs by noon and students will begin a full five days of box making fun. I have 17 students registered for the class. 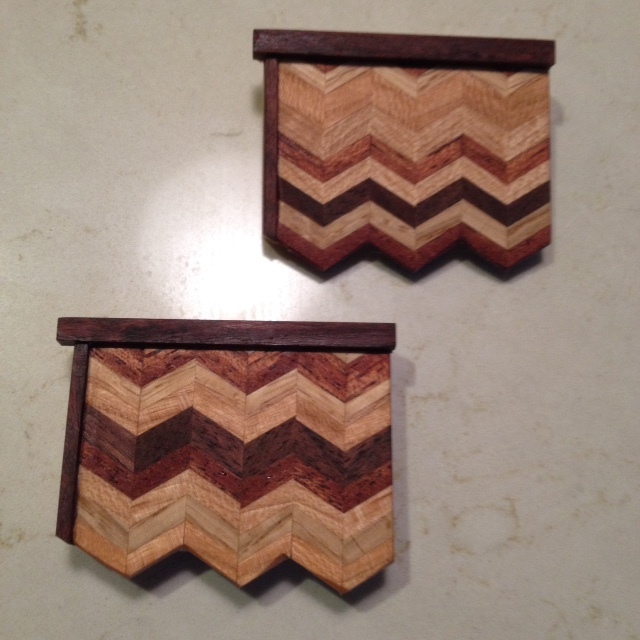 Yesterday we concluded a weekend class in making tiny boxes and it turned out well. All the students went home with 4 kinds of box to finish in their own wood shops. As I explained, my objective was to get them thinking and send them home with evidence of learning. My class starting today will have similar objectives. I have been too busy to take any photos and will try to do better during the week. 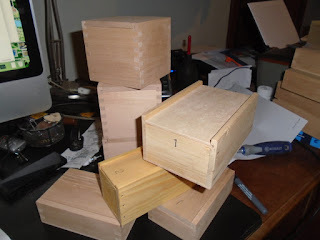 This morning we start our second day of making Tiny boxes, and I have a lot on my mind... setting up jigs and shepherding 17 students through the remaining steps on making a small variety of tiny boxes. We are making tiny tine (pronounced tee-na) bentwood boxes. 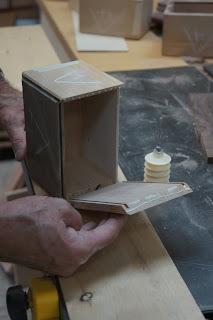 We are making two kinds of pocket boxes, and tiny boxes made with lift off lids and sides shaped with a molding cutter. The weekend classes at Marc Adams school are intended to be more relaxing than the weeklong classes, but for teachers, that is often not the case, as we know how much learning can take place, and how much can go wrong in the process. But there is no real learning without error, and perfection is not our goal. We are hoping at best to get students moving in a productive direction. I am in Indiana and today I begin my class in making tiny boxes. I have 17 students signed up and great assistants to help. It should be a fun weekend. Many of my students will be my age or older, and in Norway, according to Norwegian Wood there is a particular interest in wood among men of a certain age. Elderly Scandinavian men with a passion for firewood are often told that they have entered something called "the wood age," or that they have been bitten by something called "the wood bug." It's not a bad bug. Compare it with chiggers. In contrast the wood bug is only the itch to do something creative and to feel a greater degree of satisfaction and fulfillment in your own life. Mosquitos carry all kinds of dangerous diseases. Ticks, too, can be a pain. They can leave an itchy welt and sometimes mouth parts are left the skin. Rocky mountain spotted fever and Lymes disease are associated with tick bites. And spiders can be even worse. The real challenge is to give children the woodbug at an early enough age that they may make something more of it. But even at a later onset of the bug bite, it can work wonders for the spirit. I am on my way to Marc Adams School of Woodworking where I'll have 9 days of class. 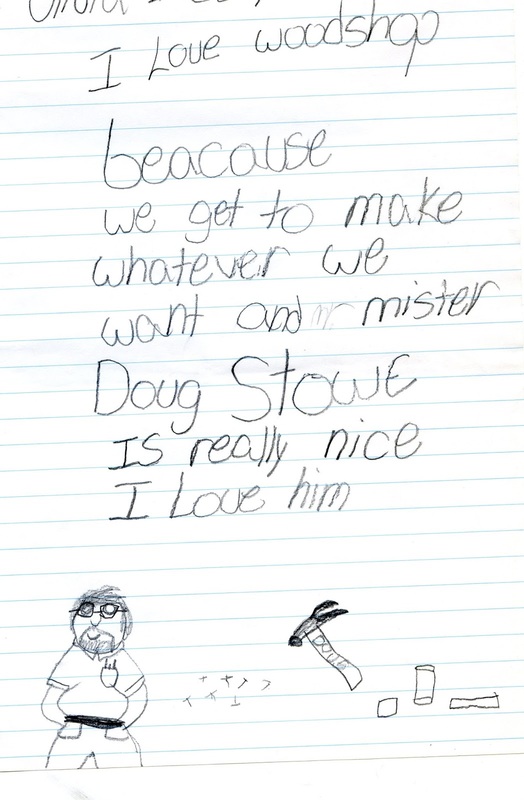 My friend and assistant who will be with me for the full 9 days calls it Stowe Camp. For all of us, I expect it to fun and a learning experience, both. If you are master of the art of setting your gear up properly then there is a special joy in seeing the way that sharp steel eats its way through the logs. The smell of resin and fresh wood, the sight of the smooth, clean cut made by a newly sharpened axe blade–such things can fill a man with a wordless joy and put him in touch with the essential joy of all physical labor: In his own hands he weighs the feel of life itself. And so it is with all work and of course work with wood, in particular gives a special joy. Today we will begin setting up material and tools and tomorrow the joy of making will begin. The following is from the course of study set for Chicago Manual Training Schools in 1899-1900. No set of models can express the manual training idea, nor can any definite course of work be applicable to all of the diverse conditions to be met in one city or even in one school, consequently the courses shown are arranged merely as a base from which to work. Considering that the development of the child morally and mentally is the object of education, then the acquisition of skill, which heretofore has been the dominant feature in manual training, will become incidental, and the exercise of the faculties in self-expression will become the basis for our teaching. Not that the training for skill is to be neglected, but it should not be fostered at the expense of the child's broad understanding of nature and nature's laws. A closer relation between the work in the shops and the work of the grade teacher is desired in order to give life to the work of the shops, which should be considered as school laboratories where the work of the class-room is to be more fully developed. The special teachers of manual training should keep in constant touch with the progress of the grades, and should, as far as possible, plan to have each lesson express in some way the work which is being carried on in the class-room. Today I am driving to Indiana for 9 days of class at the Marc Adams School of Woodworking. When students are encouraged to participate in the arts, whether it’s playing an instrument, drawing a picture or learning a dance routine, they not only discover a healthy method of self-expression that builds their confidence and sense of well-being, they become genuinely excited about going to school. Children who are enrolled in arts classes or attend schools where the arts are incorporated into lectures in all subjects are more likely to feel satisfaction at school and less likely to have disciplinary issues. It is a real challenge to teach teachers who've never done anything in the arts to then teach kids who've never had the opportunity to do real things. The name "Arts Reconstruction" fits, and it's just what every teacher needs. A similar crisis in education existed in the 1880's when American educators suddenly began to realize that schools should begin preparing students for reality outside the classroom, and they also began to realize that student attention and behavior inside the classroom would be improved if the children were not expected to dwell completely upon abstraction that was irrelevant to their own lives. The guiding principle of both Kindergarten and Educational Sloyd was to start with the interests of the child. As we drifted further from that principle, education in America began to suffer for it. what a teacher is to watch for. First. Are the child’s positions and movements while working such as are likely to be injurious or beneficial to his physical development? Second. Is he doing his own thinking, unprompted and uninterrupted by the teacher? Third. Is his work so carried on that self-respect is developed rather than vanity? Fourth. Is he learning to recognize and to love excellence of workmanship, as shown by becoming more and more critical of himself and his own achievements. Fifth. Is he learning to recognize good form and to avoid unsuitable decoration? Sixth. Is he getting some training in good citizenship by working with others? Seventh. Does the finished product represent the child’s own effort, and is the workmanship good; or was the problem too difficult? With these principles in mind, woodworking projects were designed and selected so that the child’s work, intelligence and skill would proceed accordingly. But with one caveat. As in accordance with the philosophy of Friedrich Frobel, the interest of the child must always be considered. 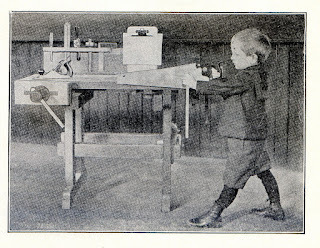 Gustaf Larsson warned in Elementary Sloyd and Whittling, “Although the models and the directions here outlined have been planned with great care, it must be understood that they are not recommended as a fixed and unalterable plan of work. Teachers should always change the methods and models in the interest of general improvement or adapt them for special needs.” Among, and perhaps foremost among the special needs that were to be considered, was the interest of the child. I am packing for my classes in Indiana. I am also moving my work from one downtown Eureka Springs Gallery to another. As of today, my boxes can be found at the Jewel Box, 40 Spring St. Eureka Springs, AR. If you give a child a tool, give a real one. This image is from Gustaf Larsson's book Educational Sloyd and Whittling, published in 1906 and available from several online sources. 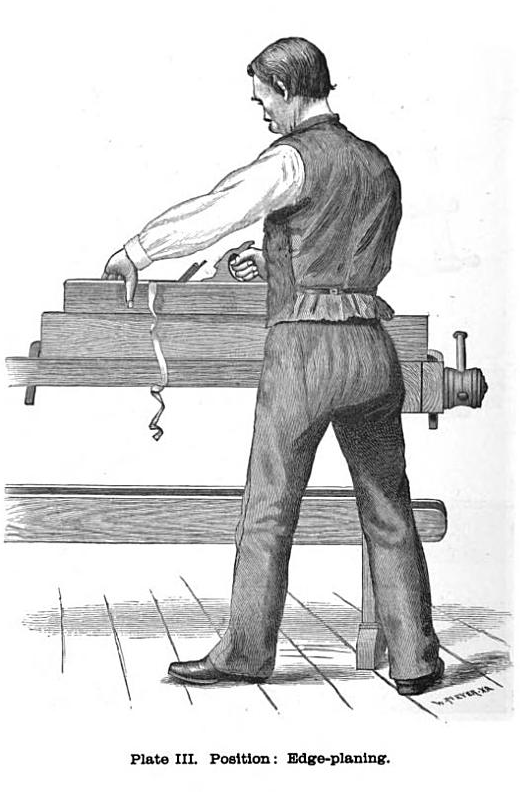 The saw and various tools are smaller versions of the ones used by real carpenters, but were finely made to do real work. I am reminded of a woman I met at a conference who had bought woodworking tools for her grandson, only to learn that her daughter-in-law refused to allow them in the house. The child was not to be trusted with real tools. He might damage the furniture or might injure himself, or make a mess, and yet this would be the same boy who at a later age is given a car and text messaging device and is expected to become mature enough to do real work. What can you say? In English you might say stupid. In Norwegian, you might say dum. In Swedish the same. In any case, and wherever you might be, to refuse children the opportunity to do real things with real tools is a fearful thing with real consequences... They might be left dum. So, are there any educational advantages inherent in the old tools like those shown above, vs. the more modern computer driven tools in which the skill and intelligence are embodied in the machine and not in the body and mind of the child? Does that question answer itself, or what! I have been a slave to my desk the past couple days, supplying my editors with missing materials and scanning lovely photos from very old books. Make, fix, create, and offer to others the joy of learning likewise. 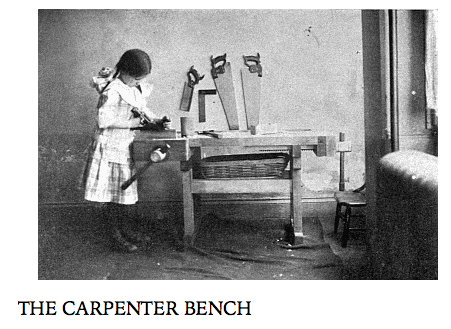 I have been attempting in my writing to describe the impact of Kindergarten on American education but could do no better job than was offered in the following from Nina C. Vandewalker's historical treatise The Kindergarten in American Education, 1907. Materials to build the imagination. 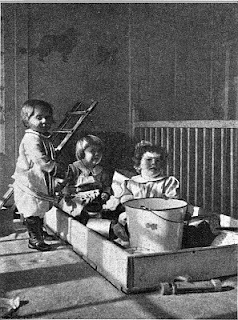 At some point, the impact of Kindergarten became less and the tide swept back in the other direction to the point that Froebel's ideas and philosophy are only tenuously connected with the institution he named and invented. As Kindergarten became institutionalized as part of American education, enthusiastic Kindergartners in love with early childhood learning, were replaced by trained teachers held accountable to standards. Please don't get me wrong. It's not the trained teachers who are to blame for the status of American education. It has become time once more, for parents, teachers and grandparents to take matters and materials into our own hands, put the fun back in learning and drive the policy makers back into the darkness from which they came. Some may be old enough to remember when you could get crates from the grocery store that were made of wood and useful for basic woodworking. Peach and apple crates provided both thin wood and thick and all you had to do was pull a few nails and get exactly what you needed for free. But those days were disappearing as I was a child and are long gone. Still, scraps from a construction site can keep a child's hands and imagination working for months. The lovely photograph above is a great reminder that girls can partake successfully of the woodworker's art. When do you think the time might return that adults involved in education will come to their senses and begin to understand that children can and must be involved in doing real things, of which woodshop is an example? I was contacted by a museum in the UK planning a 5-7 year display and wanting to use this image that I'd first posted to the blog in 2008. It is a free image from the New York Public Library Digital Collection. And you can see that it displays Froebel's construction gifts, including blocks of a much larger size. That all of the intricate constructions are in a relatively perfect form suggests that they were assembled by adults in staging this photo. Anyone with experience working with kids will know that meeting such a high level of photographic perfection would be impossible if left up to 5-year-olds,who in this case have been ever so patient as the teachers and photographer were working toward posing them in the near perfect shot. I had some fun today making simple clamps for box making that you can make yourself. These are made with 1/4 in. threaded rod, plastic knobs and wood. One end of the threaded rod fits into a hex nut buried in the wood. Though crudely made, these work great, and certainly as well as expected. Froebel, the founder of the kindergarten, was himself opposed to the term Froebelian. The master's hand is often seen in what may on the surface appear his very inconsistencies. "Personal following," Froebel declared, "separates; principles alone unite. Follow the principles I have indicated, but not me. I am but a weak exponent of the dawn of insight into that principle, and you who do this work must see to it more clearly than I have done." 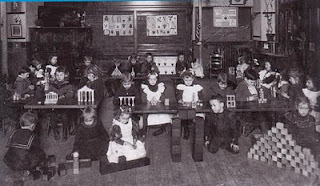 I am trying to do a bit of writing about the effects of Kindergarten to finish up my book Toys that Teach, and it's hard to get my clumsy paws around the full scope of the impact Froebel's kindergarten had. Here's the deal in a nutshell. Kindergartens exactly as Froebel intended were a major force for change, but that change did not last. The idea behind kindergarten was misunderstood and rejected by some and partially understood and mis-applied by others. Some thought that the gifts themselves would have enormous powers of awakening the young, and others used to gifts to establish routines that could themselves be just as oppressive as the rote learning children had faced in the first place.The gifts, too, were only a small part of what Freobel had in mind. Nature studies, music, finger play, gardening, and so many other natural forms of childhood play took their place in the Kindergarten scheme. In the woodshop, I've finished 20 pins of the type shown in the photo above, and I'm busy getting tools and materials ready for 9 days teaching in Indiana at the Marc Adams School of Woodworking. "It's the economy, stupid," is a phrase promoted by the financial and governmental sectors to assert their importance and their firm grip on power over those who are untrained or disinclined to do for themselves. On the other hand, (and we have two) when you do something for yourself, whether its in the garden, kitchen or workshop, for which you've only yourself to pay (and payment comes in the form of increased satisfaction and self-esteem), you are not part of the economy, but you are part of life itself, in an even more certain way than through the buying, consuming and selling of stuff. I think it is useful to remind ourselves, that as so many obsess about the "economy," there is much more to life than economy. We can choose instead to reach into our own lives and begin doing meaningful things with disregard for "the economy." We might even choose the power of love and of art or of music instead. This is not to say that the economy and its ups and downs does not have a major impact on our lives. In the 1980s I dreamed of having a barn where I could store lumber, that would allow me to accumulate woods from my local community. My wife and I had that built in the early 90s and it did not take long to have it full of interesting wood obtained at little cost. I even wrote an article for Woodwork Magazine called "free wood." When the recession of 2008 hit, I was reminded of depression era furniture made in the US from bits, pieces and mismatched scraps as craftsmen kept at work despite economic collapse. During the close of the Bush administration in 2008 it seemed like the economy would collapse, and I wondered whether galleries would ever order another box. But I had my workshop, and a supply of wood from which I made tables that were almost all sold within the next year. My own busi-ness alleviated my deep concerns about the world at large, and I was thankful to be self-employed. So, it's not the economy that matters, but the work and the greater sense of meaning one can derive from it. The pieces above are to become pins that will be given to donors contributing to the new Community Center that we are forming in Eureka Springs. I am making 20 of them and contributors of a certain amount of money will be given these to wear and assure others that they have given their support. Still, it is important to be able to explain the importance of what we do in the hopes that some will understand. The box in the photo above, I did not make. Instead, maker, Werapong in Thailand had watched my videos and learned what he needed to know. He asked about blade recommendations for a box maker who can't afford everything. The Freud 10 in. combination blade works quite well for both crosscut and rip sawing, and has a square top cut, making it good for miter keys like those used in the box shown above. 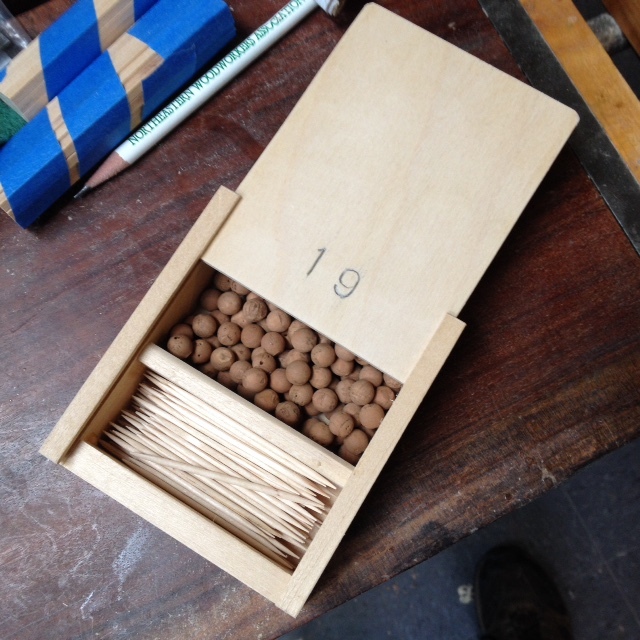 Yesterday I made a box to hold gift number 19 which was the gift that launched Buckminster Fuller toward his career as the inventor of the geodesic dome. I also remade gift number 8 to fit in a box, and colored the wooden pieces as long strips with non-toxic markers before cutting them to length. The masking tape is used to hold sticks in bundles for safe cutting. When Kindergartens came to America, the blocks commonly used grew enormously in size, with adults claiming that tiny hands could not handle such small parts. But where did they think dexterity might come from but through the manipulation of small parts? When kindergartens grew in size to classes of 30 children or more, the tiny pieces involved in Froebel's gifts would have been a nightmare for teachers. How could they manage to help thirty small children get so many small pieces put back in the box? Larger blocks as used in preschool offer social opportunities that Froebel sized blocks do not. On the other hand, smaller classes might find value in both. Today I am beginning to get ready for my trip to Marc Adams School of Woodworking where I'll spend 9 days in class. I'll begin packing books to sell and boxes to use as show and tell. 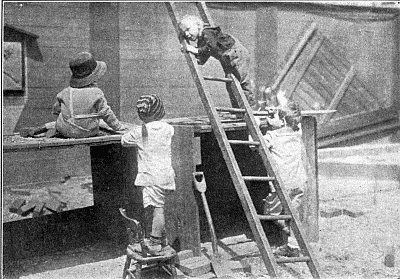 I am also working on a short essay on the impact of Froebel's Kindergarten, including the development of Educational Sloyd. Make, fix, create, and extend to others an example of learning likewise. I am packing Froebel's gifts to send to my publisher for photography and realized I was out of gift numbers 3 and 4 in nailed boxes. So that meant I needed to quickly make more. 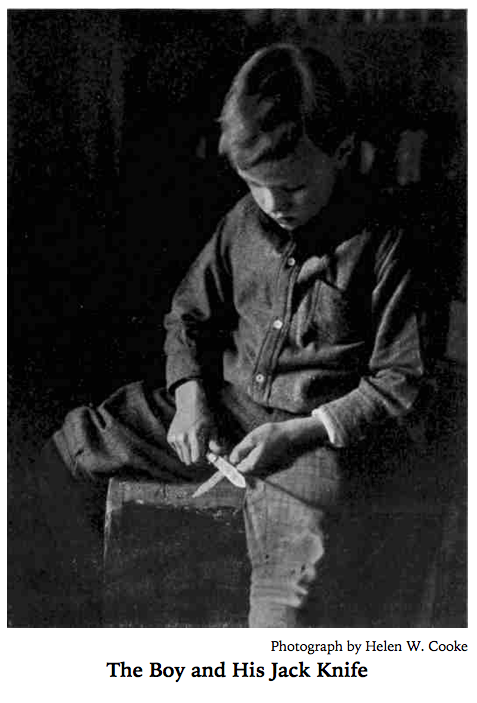 In that I am reminded of boxes I saw in the museum at Trondheim, and that while many Froebel gifts were made by manufacturers in Germany and the US, in Scandinavia, they were likely made by village craftsmen or by the parents themselves who would be no strangers to the woodworking art. 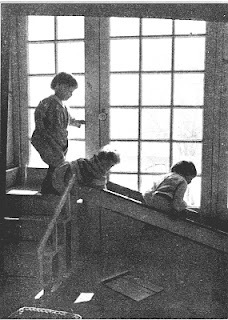 While in the US and many other nations, Kindergartens became crowded with as many as 30 children or more in a class, in smaller villages of Norway and Sweden, Kindergartens remained much more like what Froebel may have intended and offered in his own village. In Making Toys that Teach, it is my hope that parents will make what is needed for their own children, and in the process, fall in love with building beautiful and useful things. When my wife and I went to the Trondelag/Sveresborg Folk Museum in Trondheim, we rode the bus to get there along with a Kindergarten class on its way to the museum. There were about 10-12 children and three adults, a much better ratio of teachers to students than you would find in the US. Still to complete on this box will be sanding corners, sanding the edges of the blocks themselves, and stamping the number 3 in the lid. Once the material is prepared (in this case white pine) it takes only minutes to make a box and blocks and so why buy what you can make so easily for yourself. That calls to mind one of the basic principles of the wisdom of our hands. When we buy something we've invested in development (economic and intellectual) elsewhere. When we make something, we've invested skills and intellectual development in ourselves. 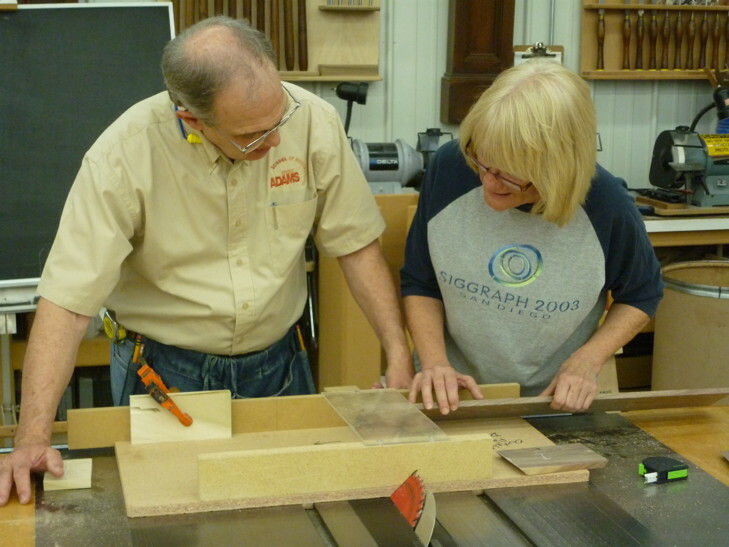 I have also been preparing materials and supplies for my classes at the Marc Adams School of Woodworking. Make, fix, create, and offer to others the gift of learning likewise. two birds and a bunch of frogs. Yesterday afternoon my wife and I went on frog watch to learn about how to identify the various frog and toad sounds we hear in the night. It is utterly fascinating how many species we have, and during each specie's mating cycle, they add to our nightly forest cacophony. To learn the sounds of each individual species can give greater insight into the health of the particular habitat that surrounds us. I am also killing two birds with one stone, though I am speaking figuratively and would be haunted by remorse were I to actually kill two birds. I am making some inlay as shown, both to create artistic badges of honor for donors to our local community center foundation, and to use in preparation for my upcoming tiny boxes class. The material added to the ends of the stock are to make it long enough to pass through the various processes after it is cut into thin slices on the band saw. Subscribers of Fine Woodworking will find a product review that I wrote on page 21 in the current issue, just arrived or due to arrive in the next few days. Make, fix, create, and enlist others in learning likewise. This morning we have hunters in our woods who have volunteered to attempt to shoot and kill the hogs that have been devastating our gardens. The likelihood that the hogs will be accessible on our property when the hunters are at hand is somewhat remote, as hogs can range over hundreds of acres and move quickly when of a mind for it. Interesting parallels leading to an obvious conclusion. About 3 years ago, AEP/SWEPCO power company attempted to get regulatory approval to build a massive extra high voltage power line through the National Military Park at Pea Ridge, along the White River in Carroll County and through the outskirts of Eureka Springs. The proposal brought a huge outpouring of opposition, and the unfortunate proposal was ultimately withdrawn by the power company after local activists in Eureka Springs, banning together as “Save the Ozarks” proved it wasn’t needed in the first place. That powerline would have permanently bisected two portions of the national battlefield and would have damaged that tourist treasure. It also would have slashed an ugly scar across the beautiful landscape of Eureka Springs, one of our state’s most valued tourist resources. There are interesting parallels between the struggles to stop the continued pollution of the Buffalo National River by the notorious C&H Hog Factory, and the efforts that successfully stopped the almost equally notorious SWEPCO powerline, one thoughtlessly proposed route of which would have passed in clear view of the Thorncrown Chapel, one of the world’s most valued architectural treasures. First of all, both proposals, the hog factory and the powerline, were put forth in a thoughtless and irresponsible manner. Secondly, both the powerline and hog factory offered direct damages to properties owned by the National Park Service. The National Park Service in both cases expressed strong opposition in the form of letters written to state regulatory agencies and in both cases received no direct response. The letters from the National Park Service are too compelling to ignore and offer direct scientific evidence of damage to water quality in the park. I have been (privately) assured that the NPS and ADEQ are meeting privately about coming to some form of resolution of the issue, and it is my sincere hope that “resolution” involves the immediate removal of the hog factory from the tributary waters of the Buffalo National River. The Clean Water Act and the National Environmental Policy Act (NEPA) are both threatened by failure of enforcement of prudent regulations in this case. According to the NEPA guide for citizen involvement, the only way governmental agencies are given the strength to protect public interest is when the public is involved. Save the Ozarks learned that lesson the hard way, by having to raise $150,000 dollars in legal fees and fighting the powerline relentlessly on every front. Nearly every citizen in Eureka Springs was involved in some way to make our community’s point known. What is called for in this situation is that we all make our support for the preservation of the Buffalo River National Park clear. Some may care about free flowing streams in which visitors may safely bathe and partake of the splendors of the “Natural State.” Let your concerns lead you to action, please. Others may be concerned about the loss of economic value. The hog factory may offer some small benefit the economy of Arkansas. But how can its small impact measure up to the $62,243,000.00 dollars spent here in the Natural State by the 1,463,304 annual visitors to the Buffalo River National Park? Pollution from the hog factory placed in the watershed of our nation’s first national river puts the entire tourist economy at risk, even here in the very Northwest corner of the state. Again, let your concerns lead you to act. I am not asking for anything unreasonable in asking for the hog factory to be closed and removed. The hog factory is very likely in violation of the Clean Water Act. Research has proven it imperils one of the primary tributaries of the Buffalo River through run-off from manure application fields. Strong evidence from dye tracing leads researchers to believe ongoing groundwater contamination from the storage lagoons and field application of manure leads to the Buffalo River. Please call Governor Asa Hutchinson’s office and demand that the hog factory be relocated far, far from the natural state. Just as it is unlikely that our hunters will kill hogs on the first trip out, the removal of the hog factory is unlikely from my having made my concerns known. 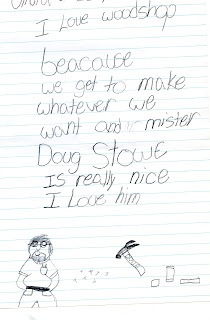 But writing to share my feeling s with others is better than just sitting on my hands. I am also gathering my full collection of Froebel's gifts so they can be shipped to the publisher for photographing the chapter lead photos and cover shots. And preparing for my classes at the Marc Adams School of Woodworking. My editors are fully at work on my Froebel book. I see folders being lifted and placed back to our drop box file during the day, as files are examined, and the editing begins in earnest. I spent part of the day yesterday at the computer finding and sending missing files, and adding text and illustrations that the editors have decided are needed. I've a few more book things on my to do list for today. My end of the year conference reports have also kept me at my desk, and this year I'm including student reflections in my report. I have my school woodshop ready for ESSA classes but for one more trip around the room with a vacuum cleaner. And the architect has finally settled on a roofline and floor plan for the new woodworking facility at the Eureka Springs School of the Arts. Last night at a party for some of my former students (Ike and Cara) who are going to the Peace Corp and are leaving for a year in Africa, someone asked if we will shuttle Clear Spring School students to classes in the new ESSA woodworking facility, but it has become quite clear to me that access to tools, materials and processes involved in woodworking needs to be immediately available and accessible to all kids. The party last night was held at one of my former student's home. Kyle does tree work (primarily climbing), but shows genius in making things. He and one of my other former students, Daniel, have a small workshop in Kyle's concrete dome home in which they spend their spare time making beautiful hand crafted knives. When their 60 year old belt sander motor broke, they mounted the sander on a discarded treadmill, turning it and the sander into a variable speed sanding/grinding contraption that would make any Rube Goldberg wanna-be envious of their inventiveness. It was obvious they are very proud of their work. Ike, my former student going into the Peace Corp is also a knife maker, and my other student present at the party (Jordan) makes guitars. With these students involved in such arts, I can see a bit of my own influence and encouragement trailing off into new generations. In any case, I highly recommend that others get involved in teaching young people to do real things. The reflection from one of my students shown above shows the kind of feelings that arise when personal empowerment is offered through the use of tools, materials and guidance in the woodshop. Today, in addition to more conference reposrts, I plan to spend some time writing about the full impact of Froebel's philosophy on education at large. Every craftsman will know that perfection is elusive. Part of the problem is that as we grow in what we do, we face a shift in values and understanding, thereby moving the goal post further away. As a teacher I encourage my students to see their work clearly and from such a perspective that they may see where it can be improved and where their next session of growth may lie. But we rarely see immediately before us, that which may lie down the road, even years away. I wrote a short essay on perfection in one of my first books, that has been republished in my new book (a compilation of my first two). 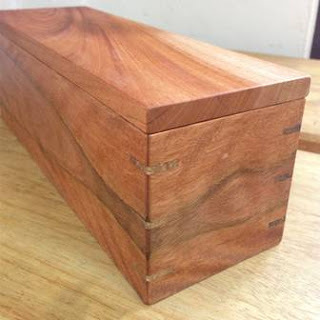 Popular Woodworking has sent that essay out in their newsletter. So I have been hearing from friends that they've received it and read it. There is also an advertisement in that newsletter offering my book for 28.99. But if you want to buy it, use this link and the checkout code Stowe15 to get the book at a discount and save money. My hope in that essay, written about 16 years ago, was to invite my readers to take chances in their work, to feel comfortable in doing new things and to learn from the experience. I have had a delay in having an editor come from Fine Woodworking for articles that were planned. 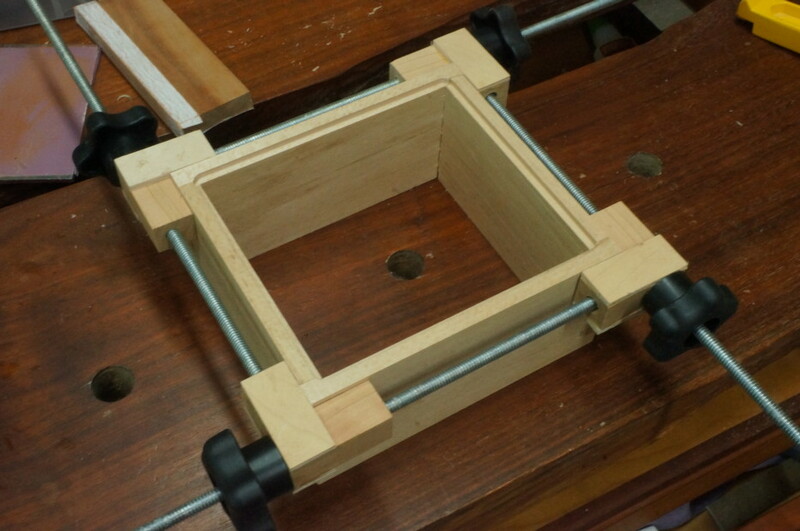 I had written an article for American Woodworker about a router table that uses a pivot fence, and even though the tables in the article are actually quite different, the subject matter was close enough as to create a sense of discomfort among the Fine Woodworking editorial staff. The editor will come at another time to shoot the other article they had planned. The delay is a welcomed relief in my schedule as I plan for classes at Marc Adams School and complete end of the year reports from the Clear Spring School. I have also been meeting with teachers at Clear Spring School to plan for the next school year. So what is perfection? The link to the newsletter is here so that you can read what I said so many years ago. It is still pertinent. And I've a bit more to add. When your work reaches a level that you may consider perfection is it because you've only chosen to do the easy stuff that poses the least risk? Growth is always fraught with error, and occasional disappointment. And so if perfection is to be found in the process of growth and not necessarily ever in the object created, is it not there in every sincere act? Speaking of which, there is a brief article on the importance of empathy in Time Magazine this week. It seems that the age of the selfie is not working out so well for our kids or their parents, or for our culture at large. Perhaps, on the brighter side, the selfie age may lead children to do real things. Looking stupid on the www. can only go so far. Yesterday I returned the grandfather clock we rebuilt at Clear Spring School to its owner, and I brought a box guitar to near completion. I am getting ready for summer classes and the possible visit of an editor from Fine Woodworking to take photos for two articles. There are days when I feel poised on the edge, simply preparing for other things. A fellow teacher/friend told me yesterday of a lesson he learned from his one-year-old Labrador pup. Tony loves to kayak. Buddy loves to go along. When the dog was younger he could place it on the kayak, and they would go happily along across the water, the dog perfectly content. As the Buddy has gotten older and larger, he does not want to get on the kayak. Tony described trying and trying to get Buddy to get on. Tony described getting angry and frustrated, and as he became more so, the dog became less compliant. Finally, Tony just gave up and allowed the dog to simply swim alongside. They had a wonderful day together. And I am reminded of how wonderful summer vacations can be. Teachers can become burned out, and subservient to the process when what they need most is to step back and bring their challenges and opportunities into better perspective. It pays to pay heed to the natural nature of things. Tony found a parallel in the dog's behavior and his student's participation in class. The challenge of teaching is to do wonderful things together, and to resist the inclination to teach in the same manner in which we were wrongfully taught. That will make little sense to those who've taken administrative positions in which rigid goals have been set to shape them to fit futures we can scarcely imagine. There is a simple saying in the American South, "you can't push a rope." But you can pull one with far less effort. Friedrich Froebel had said, "let us live with our children." He did not say, "let us live slavishly for our children." And he did not say, "Let's force our children to be like us." If you are going paddling today (I recommend it) take a dog along.